Greenwood, M. 2016. Determinants of Health Model. Developed by Dr. Margo Greenwood, the Determinants of Health Model presents a way of thinking about the complexity of individual and collective health and well-being. It is meant to provide a more holistic way of understanding children and their health within their collective and broader society. This model assumes that the health and well-being of children and youth is impacted by their family, their community, as well as by the broader societal systems and structures in which they live. Alignment of these interdependent elements is key to supporting and building healthy communities and families that, in turn, impact individual well-being. Structural enablers of well-being include high level legislation, policies or agreements that either enable or hinder the development of healthy, positive environments for children, youth and families. Health service delivery agreements, governance and land treaties are examples of structural enablers that can either support or hinder well-being. Community enablers of well-being include feeling safe, supported and engaged. Opportunities for land-based learning, participation in cultural ceremonies and events, language learning activities and recreation/sport initiatives, for example, that are provided at the community level can greatly contribute to family and individual health and well-being. Family enablers of well-being help build strong, healthy, families. Parental age, employment, education levels and health, as well as parental life style behaviours that impact children such as smoking, folic acid use and breastfeeding initiation, are important contributors to overall family well-being. The home environment has an enormous impact on children, especially young children. Supporting parents and caregivers to make healthy choices for themselves and their children is essential. The early years (ages 0-5) are a time of extreme growth and development for children. Prenatally, young children can be exposed to influences that impact their birth outcomes, making education and care of pregnant mothers critical. Equally important are the environments in which children grow up. Children with access to healthy food, physical activity, quality education, health care and positive parenting tend to be healthier and better equipped for the challenges they face growing up. 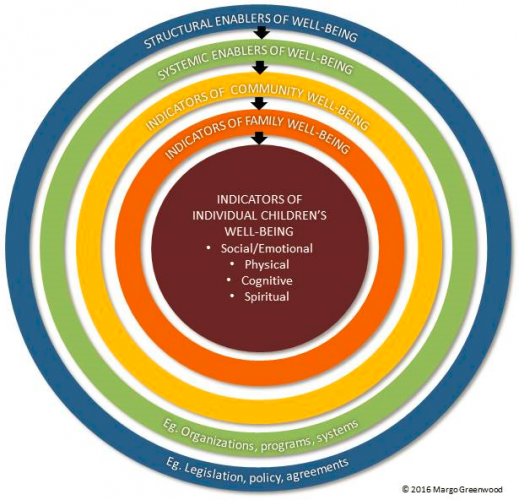 Individual well-being is at the heart of the model because in the end, all the other layers of the circle impact the health and well-being of the individual. When looking at individual well-being, it is important to examine social/emotional/cognitive, physical and spiritual aspects to ensure a holistic approach is taken. Ensuring enablers are in place to support all aspects of health and well-being is essential and needs to be the goal of every other layer of the model.